Why do we use the phrase, “As easy as pie” when referring to a job or task that should only take minutes and little work to complete? After all, rolling out flaky pie crust, mixing up the perfect filling and baking a pie is really not that simple! Maybe the common saying refers to how easy it is to eat up a slice of pie? Regardless of its origins or appropriate meaning, the four-word phrase inspired me to come up with a pie recipe that really is easy to make and delicious to eat, of course. 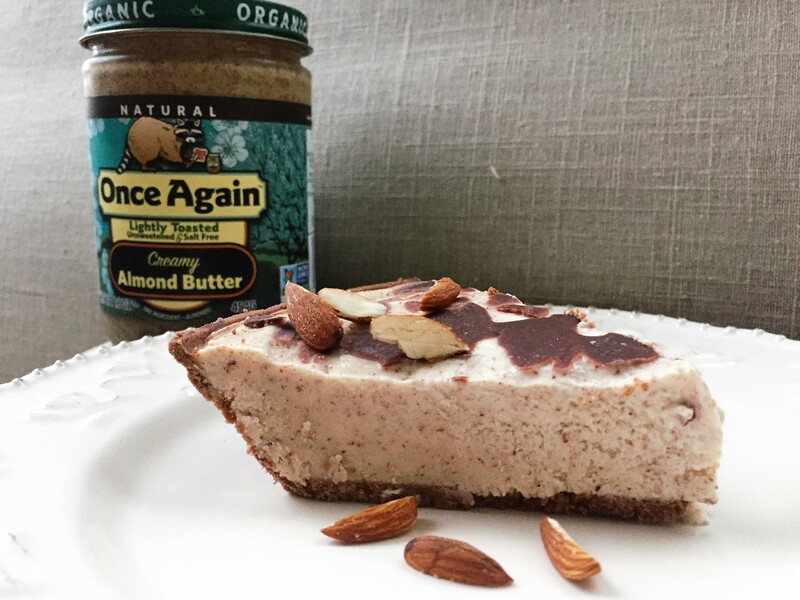 There is no need to roll out dough or preheat the oven for our Almond Butter Pie recipe. This is a freezer/refrigerator pie that uses a cookie crust. The cookies most commonly used for crusts are graham crackers, but feel free to crush up your favorite to make this crust. Chocolate graham crackers crushed up inside a sealed plastic bag, then mixed with coconut oil take only minutes to prepare, and makes a rich pie crust that goes well with any Once Again Nut Butter you choose to mix in for your pie. There is another surprise in this recipe — it is a healthier pie you can indulge in, even having two pieces at a time if you’d like to! There are only two ingredients: Greek yogurt and almond butter. You may add maple syrup as an option for a sweeter version, but honestly you won’t miss it much if you don’t. The pie goes into the freezer for 45 minutes, then into the refrigerator for 10 minutes before serving. It is best to eat it right out of the refrigerator. It can melt if left outside for too long. I made the pie in a 9- inch glass pie dish, but next time I plan on cutting the recipe in half and making it in single serving glass dishes instead. The larger pie is perfect for a party or larger family dinner, but when it’s just there are just 3-4 people to serve, the smaller recipe would be just perfect. Prepare the crust first by crushing the graham crackers in a sealed plastic bag; then add to glass bowl and mix with about two tablespoons of coconut oil. You may add extra oil if your crust is not sticking together well. Place in 9-inch pie dish and press to form crust. Set aside to prepare the filling. Mix 28 oz. of Greek yogurt with one cup of almond butter. You may choose peanut butter or sunflower seed butter as well! Mix well using a large spoon, and then add it to the pie crust. Place in refrigerator until about 30 minutes before you are ready to serve. Then set it in the freezer for the last 30 minutes. This will make the pie easier to slice and serve. Peanut Butter and Jelly Muffins: Relax and Enjoy! Zucchini Muffin Recipe: Veggies in your muffin? Why not! This is one for my Pinterest Recipe Board for sure! This truly looks delicious and I look forward to trying it on one of my “splurges” since I’m trying to stay on track with my nutrition. wow I love almond butter and what a wonderful way to use it. I’m excited to try this and share it to let ppl know how good this almond butter is! This sounds heavenly! Can’t wait to try it! Love that its only a few simple ingredients too! Thanks so much for posting this! That pic makes me wanna reach into the monitor for the slice…lol!! Looking forward to trying it!! !